Owner: Avalon Bay Shipping Co Ltd, Monrovia. Operator/charterer: Hapag Loyd AG, Hamburg. Flag: Singapore. Built: 1960 by Howaldtswerke Hamburg AG, Hamburg, West Germany. Yard no. 953. Propulsion: nine-cylinder, two-stroke Howaldtswerke-MAN K9Z 78/140C of 9,000 bhp at 115 rpm. Speed: 17.5 knots. Built for Norddeutscher Lloyd AG, Bremen. 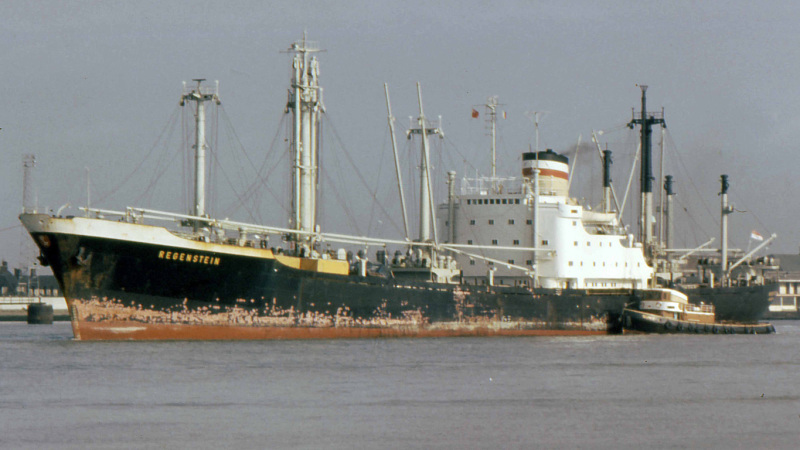 1970-to Hapag-Lloyd AG on amalgamation of NDL and Hapag. 1984-to breakers at Xinhuang, China 22/5. Photo: 5/2/1978 arriving Tilbury Dock. This photo has been shown 438 times since it was added to the site.